Goodbye 2017, welcome 2018! Zebras are ready to rock! Home » Goodbye 2017, welcome 2018! Zebras are ready to rock! As you can see from the picture, Zebras certainly do love a good party and that is no news! 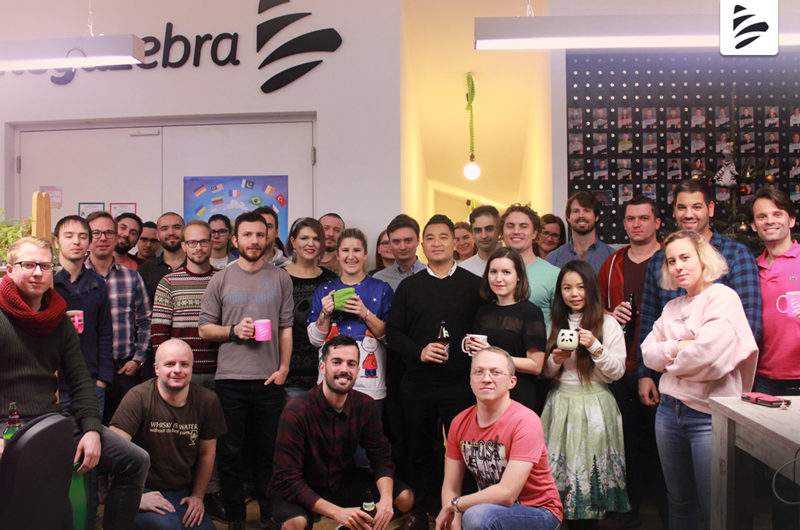 Like every year, our hardworking Zebras wore their party hat and celebrated the end of 2017 with a bang… and presents… and Glühwein. And oh man! They had some good reasons to celebrate! 2017 was a full year, one of those years that we certainly won’t forget so easily. Lots of big things happened and, just in case you forgot about them sipping your mulled wine, here’s a handy summary of our biggest achievements. Brace yourselves, grab yourself a cup of tea because… it’s going to be a long ride! • Mahjong Trails Match live on iOS and Android! Another Mahjong game, you say? Not exactly. MTM (like we like to call it) is the next evolution of our world-famous Mahjong franchise. Our Team worked hard on revamping the classic Mahjong gameplay and created a brand new remastered and updated version for mobile! Awesome design, exciting new characters and unique levels. Sounds like fun, right? If you missed it, it is the right time to catch up. • Mahjong Trails celebrated its 7th birthday! • Suburbia 2 turned 1! They grow up so fast… Our baby is one now and it already got to Season 2! Suburbia 2 is constantly evolving: we introduced new characters, new storylines, new delicious recipes, new craft machines. As you can see, the keyword is new. • Desperate Housewives: The Game live on iOS and Android! We saved the best for last. This was HUGE for us and it is safe to to say that it was the biggest milestone of the year. For the first time, we worked together with ABC to release a dramatic new prequel to the hit TV-series. In case you don’t know (so you must live on Mars), the game combines modern, free-to-play game-mechanics, stunning graphics, and an intricate and interwoven murder-mystery story. The team worked day and night to deliver the best possible game and we are indeed very proud of it. As for the other games, we are looking forward to 2018 because #DHthegame will shine even brighter with its new features. Last but not least, a HUGE thank you to YOU, dear players. For your support, for your engagement, for your love and feedback. We are excited for 2018 and you are definitely in for a treat!